This past week I’ve been taking it easy and recovering post-marathon — taking a break from running, getting a massage, and eating plenty of fruits and veggies. Everyone tells you how tough the ACTUAL marathon is, but no one tells you how unbelievably SORE you are after you run! After 3 days of hobbling around, I finally was starting to feel like myself again. Yesterday, I was feeling particularly ambitious and decided to try out a new spinning class. The place is called SoulCycle. And the verdict: it TOTALLY rocks. It was really unlike any other spinning class I have ever experienced. Immediately upon entering this clean, well maintained exercise studio, I was warmly welcomed by the folks at the front desk, who handed me a pair of cycling shoes (the one down-side — you have to ride in cycling shoes which you can rent, but you can’t wear your own sneaks). I grabbed a locker and a towel — another perk is that they have a very nice shower/locker area — and headed in the spinning studio to set up my bike. I was welcomed by the awesome instructor, Jenny, who helped me align my bike perfectly (ok it’s been a WHILE since I last spun) and made sure I was totally comfortable. The room was clean and really calming – which is odd considering that I usually feel slightly terrified when I enter a spin studio. Clearly, these classes are super popular because the studio of about 50 bikes was completely full by the time the class got started. Immediately Jenny’s bubbly enthusiasm got everyone pumped for the ride ahead. The music was awesome — a little Michael Jackson, a little Kanye, a little upbeat techno. The class itself was definitely tough, but overly so (I’ve had some traumatizing spinning experiences in the past). And the best part? It was a total body workout. How can you do that on a spinning bike you may ask? It’s called freeweights. In the middle of the ride, we picked up 1 lb freeweights on the side of our bike and rode while working our biceps, triceps, and abs. Pretty cool right? I think so! After a very sweaty 45 minutes, I emerged, feeling strong and rejuvenated. While the classes are a bit pricey ($32 dollars a sesh), I got the inside scoop and found out that they offer “community rides” on Wednesdays at 1 pm, which are free classes where new instructors can use you as their guinea pigs. Which I personally am ok with! 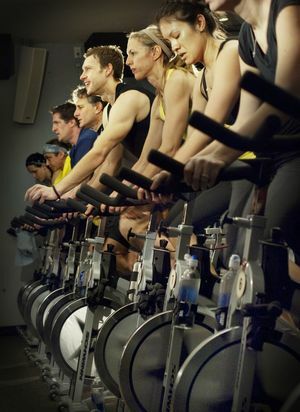 Soulcycle has studios on the Upper West Side, the Upper East Side, and Tribeca. Check them out! Sounds like a great class! Definitely want to join you next time I’m in NY!